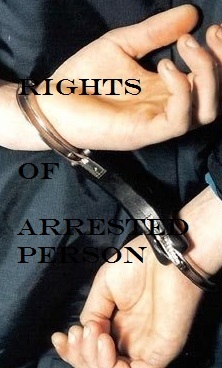 (a) Right to be informed of ground of arrest. Section 50 (1) of Cr. P.C. : Every police officer or other person arresting any person without warrant shall forthwith communicate to him full particulars of the offence for which he is arrested or other grounds for such arrest. Object: – It is one of the principles of natural justice. (b) Obligation of person making arrest to inform about the arrest etc. to a nominated person. Section 50 A of Cr. P.C. : [(1) Every police officer or other person making any arrest under this Code shall forthwith give the information regarding such arrest and place where as may be disclosed or nominated by the arrested person for the purpose of giving such information. (3) An entry of the fact as to who has been informed of the arrest of such form as may be prescribed in this behalf by the State Government. (c) Right to be informed of right to bail. Section 50 (2) of Cr. P.C. : Where a police officer arrests without warrant any person other than a person accused of a non-bailable offence, he shall inform the person arrested that he is entitled to be released on bail and that he may arrange for sureties on his behalf. (d) Right to be produced before the Magistrate without delay. Section 56 of Cr. P.C. : Person arrested to be taken before Magistrate or officer in charge of police station. –A police officer making an arrest without warrant shall, without unnecessary delay and subject to the provisions herein contained as to bail, take or send the person arrested before a Magistrate having jurisdiction in the case, or before the officer in charge of a police station. (e) Right of not being detained for more than twenty-four hours. Provided that such delay shall not, in any case, exceed twenty-four hours exclusive of the time necessary for the journey from the place of arrest to the Magistrate’s Court. (f) Right of not being detained for more than twenty-four hours without judicial scrutiny. Section 57 of Cr. P.C. : No police officer shall detain in custody a person arrested without warrant for a longer period than under all circumstances of the case is reasonable, and such period shall not, in the absence of special order of a Magistrate under section 167, exceed twenty-four hours exclusive of the time necessary for the journey from the place of arrest to the Magistrate’s Court. In Prem Raj v. State of Rajasthan, the accused were arrested on charges inter alia under Section 302, 307 of Indian Penal Code. They had filed an application for bail to the Sessions Judge but it was rejected. When the accused applied again to bail to the High Court under Section 439, it was held that Proviso (a) to Section 167 (2) of Cr.P.C. being mandatory in character, the remand and detention of the accused beyond the period of sixty days (prior to the amendment of Section 167 in 1978) was illegal and that the accused were accordingly entitled to be enlarged on bail. Beside this, I feel an urge to point out the other side, i.e., victims, they have either less rights or they do not have one. Our socialist, Court and even Cr.P.C. talks about the rights of arrested person, but there are no such provisions to safeguard the interest of the victim. They are ignored fully or partially, later they become the news of the media channels nowadays. Earlier or today itself, remedies are available to the accused and not to who against the crime is committed. I admit the fact that there are some people who suffer because they are falsely implicated into a case, but there are also those people who are benefitted with these provisions. Hence, I would like to conclude with that, our law system and police while investigating the case should be so particular about the case that the victim should not suffer. It is duty upon the Court of Law that it should not violates the right of liberty of any innocent person and at the same time also not infringes the rights of victims.